The name of this department is Breton for 'little sea'. It covers the middle to the South of Brittany and, thanks to the Gulf Stream, enjoys a more favourable climate than the other three Breton departments. The summers are warm, the winters are mild and lush green flora flourishes. Morbihan is steeped in mystery. No one is sure how many islands there are: Figures range from 43 to 365 depending on your interpretation of what an island is. Does land that becomes cut off at high tide count? 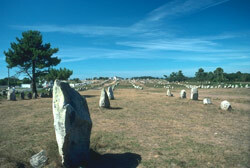 Experts are equally unsure of the purpose of the prehistoric stones in Carnac, although everyone has their own theory. Whether they're to guide alien spaceships or just tell the time, it's well worth having a look at these ancient wonders. Vannes is the departmental capital and is reminiscent of a long past era with its ramparts, ancient squares and timbered buildings. The most impressive building is the 600 year old Cathedrale de St Pierre. On the other side of the ramparts that mark the entrance to the Old Town, is a vast modern city that looks entirely different. Vannes is also home to Europe's largest aquarium with 600 species of Atlantic and tropical fish. Lorient suffered badly during World War II. In the last fifty years, however, it has rebuilt itself into a thriving industrial city. It is the second largest commercial port in France, as well as being the home to a large fleet of submarines. The name comes from 'l'Orient' or 'the East' as it was the base for the East India Trading Company. August is the best time to be there as Lorient celebrates the inter-Celtic musical festival. Thousands of musicians and singers and even more spectators turn out to revel in Celtic culture. Quiberon is perched on the end of a long strip of land stretching out into the Atlantic. This slender peninsula was once predominantly based around fishing but the tourist industry saw its potential and transformed it into a resort. There are a number of great restaurants located here, many with an excellent reputation for sea food. Head to the town of Auray and you'll be on the sight where Jean de Montfort defeated Charles de Blois to become the Duchy of Brittany. Today it makes a great base for anyone looking to take a leisurely cruise or sail. Belle-Ile is the largest of Brittany's islands and is immersed in romance. It is ideal for a day trip, which gives just enough time to explore the flowery pastures and sheltered creeks. Children will be just as captivated by the island, especially the Plage des Grands Sables, a long stretch of shore that is safe for swimming and ideal for building sandcastles. Still the best way to get around here is by bike - these can be hired upon arrival on Belle-Ile. Ferries come and go around 6 times a day. There are regular UK crossings to both Roscoff and St Malo. Caen and Cherbourg in Normandy are nearby ports with regular crossings. Ferries are convenient for those who want to bring their cars. It is also cheaper if you are booking for larger numbers or out of season. These days you don't have to spend hours crossing the Channel as there are now super fast services heading to Brittany. Flying is still an option. 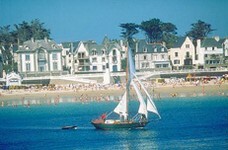 Airports in Brittany within reach of Morbihan include Dinard, Rennes and Brest. Nantes Airport in Pays de la Loire is also feasible. The North of Morbihan is where the best deals are to be found. In recent years there has been an influx of interest here, yet there are still plenty of properties to choose from. No matter where you are in this department you are never going to be too far from the sea. Away from the most popular towns, there are plenty of cheap properties to be renovated. Do you know Morbihan better than we do? Do you have photos of Morbihan? Morbihan is in the south of Brittany.